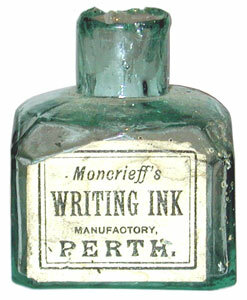 Various ink related items that were made by or for John Moncrieff Limited. Ink bottle collecting is very popular and prices remain low, typically €5 - €10 for moulded top bottles and twice that for shear top bottles. More modern bottles can be very cheap. 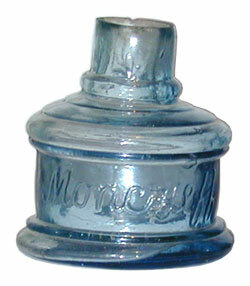 Moncrieff bottles do not appear to be rare but it is only possible to identify later types if they still bear the label. 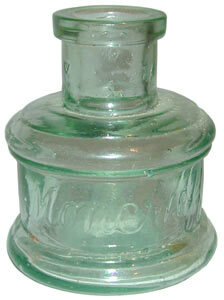 Todd's bottles are scarcer but it is not known if Moncrieff continued the brand after taking them over. 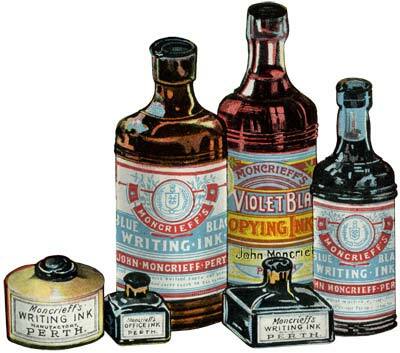 Selection of Ink bottles from an advert that was printed about 1900. 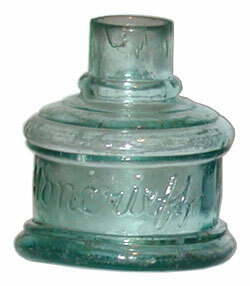 Mould blown facetted and labelled “Moncrieff Writing Ink” ink bottle with sheared top, before 1900. 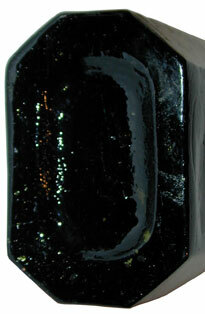 This bottle has also been reported in deep purple glass. 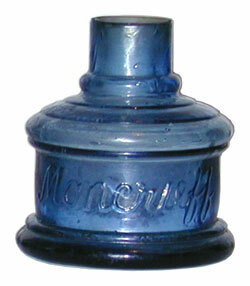 Mould blown Moncrieff ink bottles, c.1890. 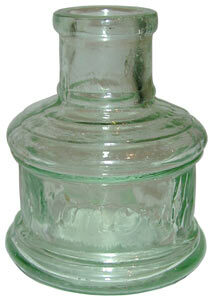 This is a type known as a shear-top ink bottle. Light blue, Aqua and Cobalt blue. Images to scale, each is about 2 ¼" (57mm) diameter, 2 ½" (60mm) high. 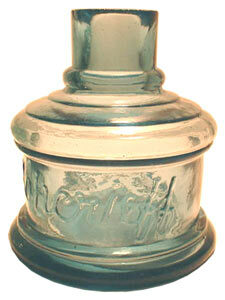 Mould blown embossed Moncrieff ink bottle with moulded top, after.1900. 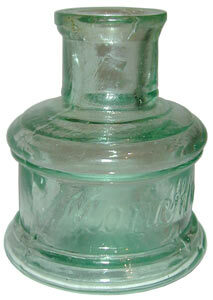 Mould blown embossed Moncrieff ink bottle with moulded top and lip, after.1900. Moncrieff were happy to use other materials than glass for bottles, I would presume this 270mm high stoneware type was bought in, circa 1890-1920? A close up of the label can be found on the labels page. 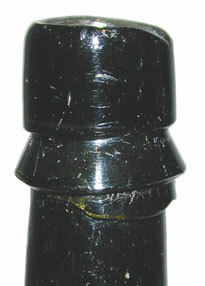 The cork top is capped with tin and crimped. 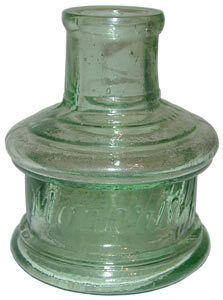 Todd’s master ink bottles, unusual as an ink bottle for both its deep green colouring and shape. No other types of Todd’s ink bottles are known to survive.